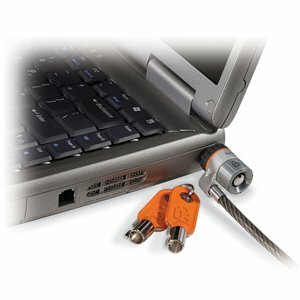 Deter thieves from stealing your computer with this 6' single piece lock that utilizes the built in security slot found in most laptop computers. If you do not have a table leg or data hole available for the Kensington MicroSaver cable to go through, see the Accessories section for available fasteners. Attaches to 99% of notebooks. Easy to install and use. Great for use in the office or while traveling. 6 ft. cable, black. 5.5mm carbon strengthened steel cable.